Rick Latham, Drummer, Composer, Writer, Producer. 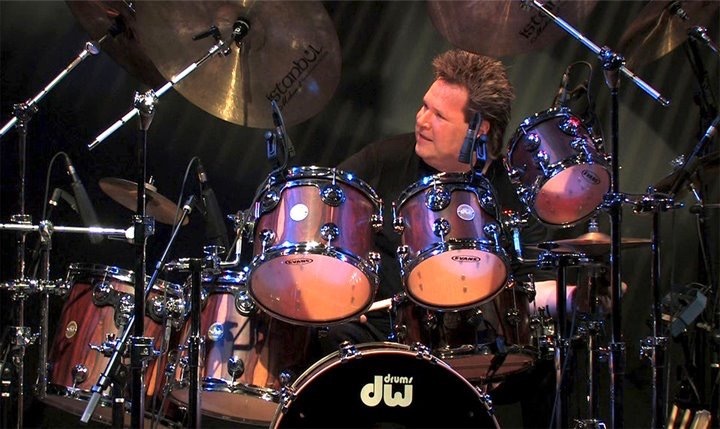 In a recent interview, Modern Drummer magazine, defined him as one to be considered among the very finest clinicians worldwide. More so, his book “Advanced Funk Studies” to be among the best 25 drum books ever published. And by the way… He performs with winning artist Juice Newton and shared the stage with BB King and Quincy Jones among others just to name a few… take a peak at his website www.ricklatham.com or anywhere on the web. Sergio: when and how did your passion for music came up? Rick: I’m originally from Columbia, South Carolina. When I was about 12 years old, my Brother (Bill, who is 4 years older) was just starting to be active in the local High School marching band (playing Sousaphone). Sergio: were your parents supportive or not? Rick: My parents were super supportive!!!!!!! They were also into the whole team effort kind of thing that the Marching Band environment offered and I believe they could also see that I was totally dedicated and had a passion for drumming and music in general. Sergio: did you attend any music schools and if so which one? Rick: after graduating High School and being deeply involved already in Marching Band, Concert Band, Symphonic Orchestra and Jazz Band. I attended East Carolina University (in Greenville North Carolina) for my Bachelors Degree and studied percussion under Harold A. Jones. Harold became a real mentor for me… This Man was incredible in every way… Musician, Person, Family Guy, etc, etc. I still cannot say enough about him. I studied Snare Drum, Tympani and Mallets. Also the Jazz Band director at ECU (George Broussard) was instrumental (pardon the pun) in my development as a jazz player. George exposed use to all the standards, and contemporaries, at that time… Ellington, Basie, Kenton, Woody, Buddy, Louie, Kenton, Maynard, Don Ellis, etc. etc. Sergio: when did you play out for the first time? Rick: the first time I played out I was actually underage!!!!!! in my mid teens specifically and played with some local R&B and Soul Bands in Columbia, SC… I also played local Junior High and High School dances with my first Rock Band (The Hypertentious Amoeba) Had a revolving Christmas Tree light inside my bass drum and the whole deal… very cool at that time…Ha…! Sergio: are there any musicians that inspire you at the present time or have done in the past? Rick: of course, there are many musicians that have and continue to inspire me… if I had to name the most inspirational… (not in any particular order) they would be, Buddy Rich, Harold Jones, Louie Bellson, Joe Morello, Ed Shaughnessy, Steve Gadd, David Garibaldi, Eric Clapton, David Sanborn, Billy Cobham, Harvey Mason, Peter Erskine, James Taylor, Bob James, Jim Keltner, Tom Scott, John Guerin, Jeff Porcaro, Bernard Purdie, Greg Errico, Don Brewer, Chopin, Ron Bushy and many others. Sergio: did you change styles preferences over the years? Rick: I don’t really thing I changed styles so much over the year but more, refined my style. I always loved Soul, Funk and R&B music, growing up in the South and playing with many black musicians and listening to this style on the radio, but I have also always been in to Jazz, Big Band, BeBoop, Straight Ahead, etc. Fusion, Latin, etc; Funk, Soul and R&B are still my first love! Sergio: is there a style of music you normally don’t play but you are attracted to? I’m a very good reader and love the feeling of Kicking a Big Band…! Sergio: when did you realize you could make a living with music and that your passion was now a source of income? Rick: I think I first realized this in undergrad school at ECU. I started to play a lot of gigs with older musicians (as the new Hot Kid In Town) and I think it was then that I realized, this is what a professional musician does, play music for all sorts of things. I then begin of thinking about playing, teaching, and performing for a living. Sergio: what motivated you to keep going during the difficult times? I also have to remind my wife and kids… “I’m a Drummer, Not a Plumber”… That’s what I do… It’s always best to call a professional. Sergio: lastly what projects are you working on at the time and what is your gear of choice? Rick: currently, I am living in Milano, Italy (which I really love) traveling, recording and playing with various artists all over Europe. I’m teaching locally here in Milano and have several very nice live projects that are getting considerable attention. I am also always working on new instructional material… books and DVDs and writing and recording a new solo record that I hope will be released later this year or early 2016. Rick: never give up! Whatever your choice might be, be sure to do it with heart and soul and to quote Ray Charles: “I don’t want to be famous, I want to be great”.